Our family is very fortunate in that one of our Christmas rituals is to catch the train into NYC while we’re visiting my husband’s family in Connecticut and take in a Broadway show. This year, we were able to catch the revival of Once on this Island in the Circle on the Square Theater. It’s a theater in the round where the audience literally sits around the stage. In this fable of a musical, there are four gods. In this revival, each of the gods appear at first as regular people on the island and slowly become the gods of the story as their costumes become more and more elaborate by using the discarded detritus one might find in the aftermath of the storm. The remnants of destruction help transform the human into the divine. Agwe begins as a humble fisherman painting his boat blue and picking up littered plastic bags. But as he uses on the paint on his face and the plastic bags become a grand headress, he is transformed in to the God of Water. 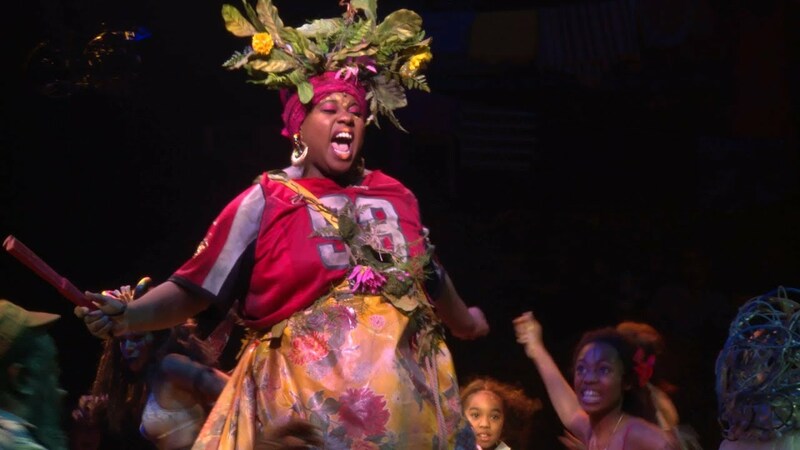 Mother of the Earth is actually played by a man who starts out cooking outdoors (there is literally food cooking on stage when the audience comes in). As the show goes on, a tablecloth is turned into a skirt that gets more and more dramatic and voluminous, and some discarded flowers become a head dress, and the street cook is transformed into Asaka. 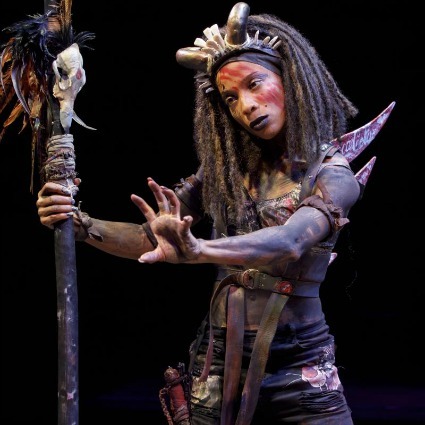 Erzulie, the Goddess of Love, starts the show in a Doctors without Borders white polo and khaki pants, milling around and checking people out. 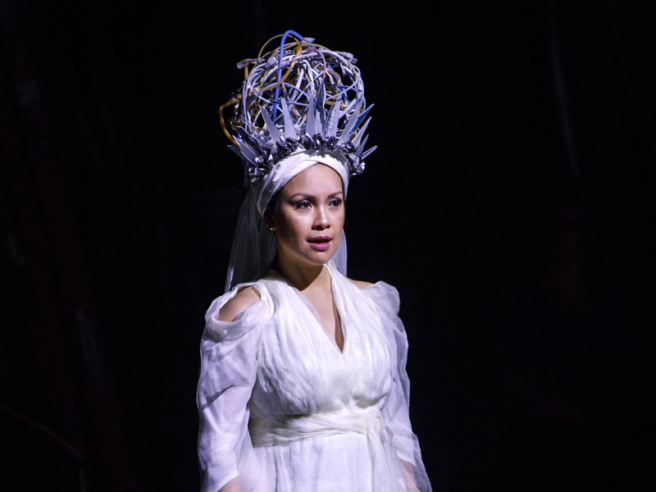 The mosquito netting she hands out at the beginning of the show becomes her veil and later, her grand headress is made of discarded wires and USB cable (and it lights up!). Papa Ge, the God of Death, enters for the first time herding a live goat on stage. In the aftermath of the storm, the grease from the truck she owns paints her body, her hair becomes wilder and wilder, and the Coke cans she collected at the beginning form an almost reptilian looking harness around her. I was sitting on the aisle, and she walked past me a couple of times. Scary as all get out. The overarching theme of the show is that love is stronger than death, but watching the gods transform throughout the show with the help of materials that have been discounted and discarded is a visually stunning reminder of how God takes what is battered and broken in our lives and transforms us with the love and mercy and grace and forgiveness that is made manifest in Jesus Christ. Our wrecked parts don’t have to ruin us. They can even be what makes us stronger and more powerful and better equipped to help others. 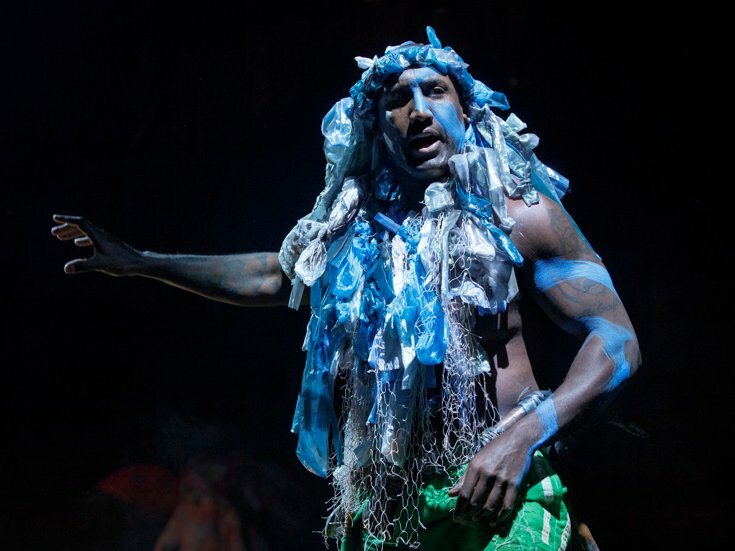 Once on this Island closes on Broadway in a couple of days, but it is scheduled for a North American tour later this year, so keep an eye out. It is something to see if you have the opportunity.